During the Spanish Civil War, Frank Swiver and his college pal, Max Rabinowitz, both fall in love with Amanda Zingaro, a beautiful and courageous Republican guerilla. They must watch helplessly as the local fascist militia murder both her and her father. Eleven years later, Frank, traumatized by the violence in Spain, has become a pacifist, a wino, and a struggling private eye in 1948 San Francisco. The S.F.P.D. invites him into a case that they hope to write off as suicide but that Joan Spring, the exotic half-Chinese spouse of a wealthy banker, calls murder. She’s a devoted wife . . . devoted to her husband's money. Is she also a devoted cadre of Chairman Mao’s? Frank uncovers more than Joan had bargained for, and when she ends up in jail, it’s up to Max, a communist and a successful criminal attorney, to spring Joan Spring. But Max abruptly pulls up stakes and moves to Fresno, where he’s soon defending a Mexican-American lector against a murder charge. Max sees a woman who is a dead ringer for Amanda, believed dead years ago in Spain. Amanda has followed the two fascists who killed her father from her home village to California, and is working in their cigar factory, biding her time until she can take revenge. Max calls in Frank to help him build a defense, and Amanda enlists Frank’s aid in her vengeance. And by the way, she says the ten-year-old boy with her is Frank’s son. Will Frank be a good father to the boy? Why does the lad look like Max? Who shot Max in Fresno? Will spy Joan Spring escape to Red China? Can Frank help Amanda avenge her father when he’s sworn off violence? Can he protect her from her target's daughter, the sadistic Veronica Rios-Ortega? 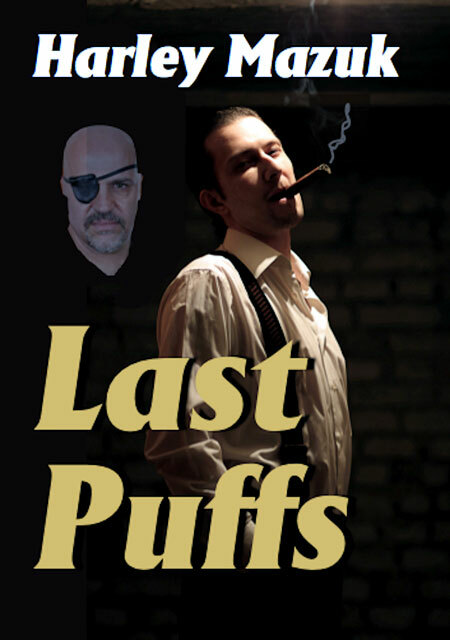 Join Frank Swiver in the swift-moving pulp fiction story, Last Puffs.